"e;Why is everyone so quiet? Is this the democracy you wanted? "e; So ask the Zapatistas, the group of indigenous Mexicans who, on January 1, 1994, mounted a rebellion against the implementation of NAFTA, political corruption, and the slow, unreported genocide of indigenous people worldwide. As the group expressed their demands and revealed their tactics, it quickly became obvious that they… were less an armed guerilla force seeking to seize state power, and much more a social movement seeking to catalyze civil society's full democratic power. For this reason Mexican political analyst Gustava Esteva has called the Zapatista rebellion "e;the first revolution of the 21st century. 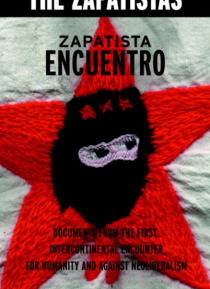 "e; He explains that whereas the revolutions of the 20th century were tests for state power, the Zapatista struggle was for greater local autonomy, economic justice, and political rights within the borders of their own communities.Zapatista Encuentro contains documents and communiqus from Subcomandante Marcos - the leader of the Zapatistas - from the 1996 Encounter for Humanity and Against Neoliberalism. This remarkable event brought together 5,000 activists from all over the world to discuss how globalization (neoliberalism) affects us politically, culturally, economically, and socially.